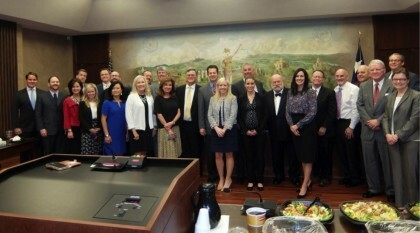 On May 8, 2018, Amy S. Ooi attended an educational luncheon held by Justice Elizabeth Lang-Miers from the Fifth District Court of Appeals in Dallas. The event was organized for members of the Mac Taylor Inn of Court in the court of appeals courtroom. In addition to Justice Lang-Miers, Justices Boatright, Bridges, Evans, Francis, and Schenk provided useful tips and information about practicing before the court, including writing effective briefs, presenting oral arguments, and answering questions from the court. The Justices invited the participants to remain in the court after lunch in order to observe a scheduled oral argument. The Mac Taylor Inn of Court is a local chapter of the American Inns of Court, and its members are dedicated to advancing the rule of law by achieving the highest level of professionalism through example, education, and mentoring. Representing SettlePou, Amy S. Ooi has been a member of the Inn since 2014 and has recently been promoted to the Barrister level. For information about the Mac Taylor Inn of Court and similar events that promote learning opportunity and growth for law students, legal educators, attorneys and judges, please visit innsofcourt.org or email Amy Ooi at aooi@settlepou.com.